Central Oregon is absolutely loaded with great places to eat and having said that, picking the 10 best places to eat in Central Oregon could be done several times over. I chose these 10 places as the best places to eat in Central Oregon because of several factors - most importantly the food and the service, also the overall ambiance and cleanliness of the restaurant and the prevailing atmosphere, and also in part due to the fact that most of these restaurants are pretty pet-friendly. I have personally dined at all these restaurants and found them to be more than accommodating on days when it is way too hot to leave dogs in the car. Some restaurants are more 'pet tolerant' than pet friendly but overall, I give them all 2 thumbs up for indulging folks and their pets - keeping in mind that pets should be well-behaved. There are 2 restaurants that come to mind for me when I think of best breakfast in Central Oregon. My first pick is McKay's Cottage located in Bend. McKay's was once the home of one of Oregon's senators and the house/now restaurant was moved to its present location. It is a restaurant that combines excellent service and fantastic food with a home-like atmosphere - whether you are sitting inside at the cottage with its lovely fireplace and wood floors or you are lounging outside (with your malamutes) at a table on the spacious lawn under the trees in the glorious Central Oregon sun. While breakfast is my favorite meal here, they also do a wonderful lunch and are open from 7:00 a.m. to 2:00 p.m. every day of the week. For breakfast, the oatmeal pancakes are to die for as are most of their dishes - like stuffed French toast - but you haven't lived until you've tried some of their homemade scones! McKay's also does private evening events such as rehearsal dinners, business dinners, etc. and the atmosphere for these events is wonderful as well whether held inside or out. This restaurant is definitely pet-friendly and keeps water bowls at the ready for canine customers who dine with their human counterparts! You will not leave McKay's hungry! Take something home from the bakery as well for a snack later. Their burgers are among my husband's favorite burgers around town! The Alpenglow Cafe has moved to a new building but the quality of the food has always been stellar. Alpenglow does not have as much spacious seating for outdoor dining as McKay's Cottage, but we have managed to eat outside with our 2 malamutes in tow a couple of times. The cafe is very accommodating as far as making sure their restaurant is kid friendly as well as being as pet friendly as possible with the space available. They have a very extensive breakfast menu from Huevos Rancheros to omelettes to smoked salmon benedict and also serve up great pancakes, waffles and frittatas. For the smaller appetite, continental breakfast choices are available. Lunch at Alpenglow has many offerings as well such as soups, salads of all kinds, sandwiches galore and burgers. 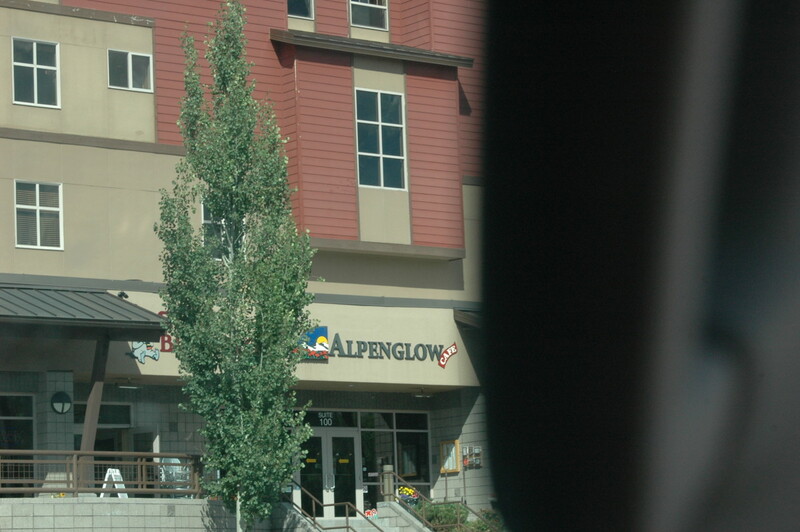 Alpenglow serves from 7:00 a.m. to 2:00 p.m. daily. The ingredients couldn't be fresher at Alpenglow as they fresh squeeze their orange juice, use only meats and fish that have been smoked within Deschutes County, use zero frozen fruits and vegetables, and bake their own breads daily. Add to that organic coffee and you've got a great place for breakfast. 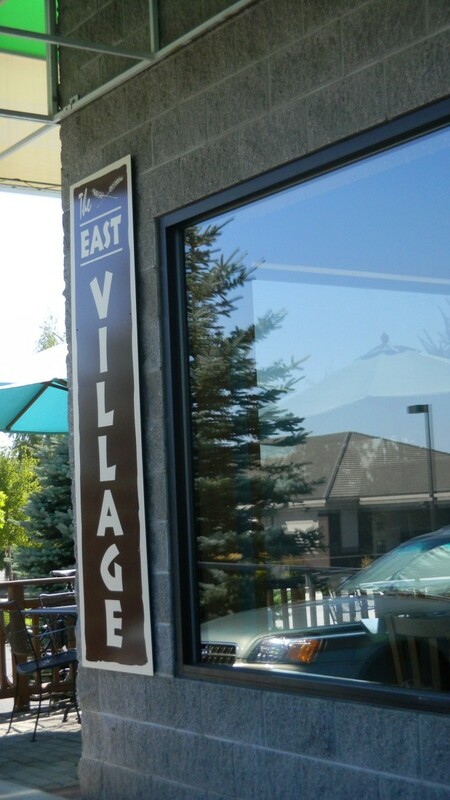 Some of the best places in Central Oregon are open for lunch and dinner but the Village Baker is only open through early afternoon. Stop in for a cup of coffee and their delicious fresh granola in the mornings along with some of their fantastic baked goods - or stop by for lunch and have a turkey sandwich with cherry salsa on their homemade wheat levain bread. For years, the Village Baker has supplied many Bend restaurants with their wonderful breads and rolls - their cibatta rolls are some of the best you'll ever taste! You can buy breads, cookies, rolls, and all kinds of tasty baked treats at either location. Both locations serve their signature chicken soup with rosemary and several other hearty soups - and of course you can order any number of fresh made sandwiches. Try a half sandwich and a cup of their homemade soup and you'll be delighted! Both locations have a few tables outside for seating weather permitting and well-behaved dogs are welcome to lay in wait for crumbs! Reminiscent of the old days when drive-ins were 'the thing', Pilot Butte Drive-in is a great place to go for a burger! You certainly won't walk away hungry and in fact, you may be waddling away if you decide on their 18 ounce burger! 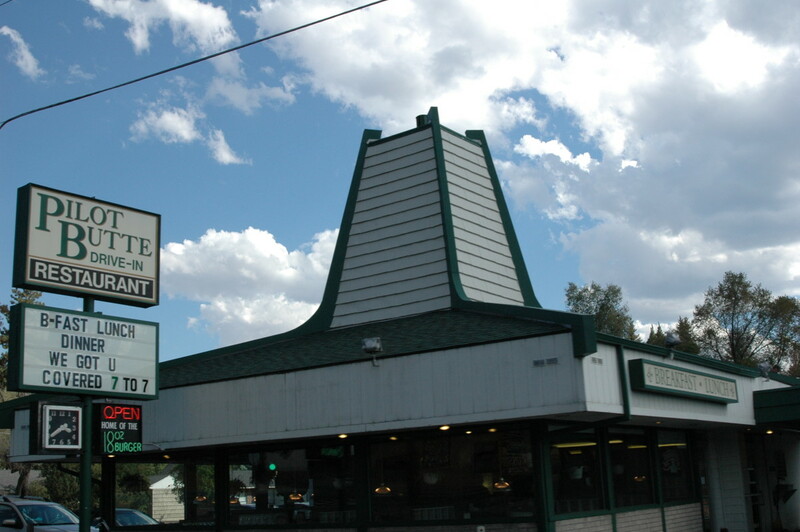 Pilot Butte Drive-in is open for breakfast, lunch and dinner - 7:00 a.m. to 7:00 p.m. 7 days per week. The drive-in really is a drive-in so you can comfortably sit in your car and order up on the speaker box or you can go on inside and order and eat your meals. Breakfasts run the gamut from eggs to pancakes to specialty omelettes while lunch is an indulgence for the burger-minded. Try one of their gourmet burgers like the Blue Cheeseburger or the Ortega Cheeseburger. You won't be disappointed as their burgers are revered in Central Oregon as top of the line! If you are not of the burger persuasion, salads, soups and dogs are also available. Remember those root beer floats? They also have those along with a great variety of milk shakes. Actually all these restaurants are open for both lunch and dinner and I highly recommend their food, their service, and for the most part have found them to be very pet-friendly, again with the caveat that pets should be well mannered. Anthony's at Bend is part of the Anthony's Homeport chain that is so popular in Washington state. When they opened a restaurant in Bend, we were ecstatic. If you want great seafood, Anthony's is the place to go. 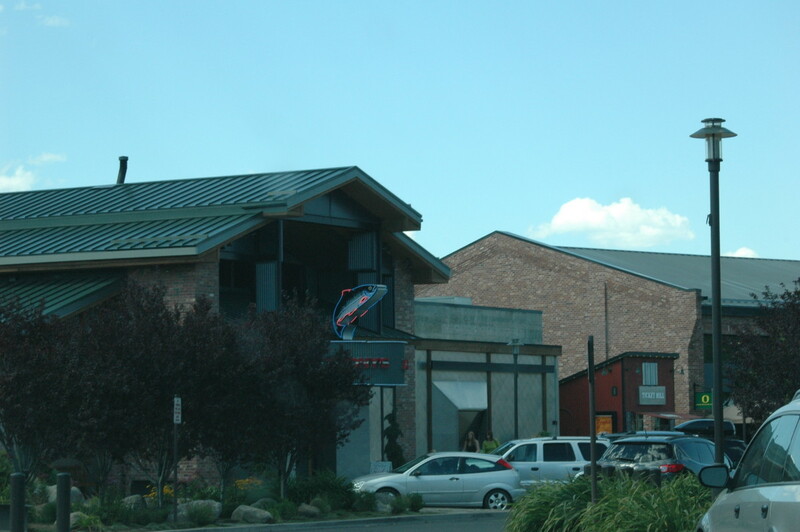 They are open 7 days a week and the restaurant is located on the Deschutes River in the Old Mill District of Bend. Not only is the food fantastic but the views are spectacular! You can dine at Anthony's on Sunday from 11:00 a.m. to 2:00 p.m. and have brunch. Lunch Monday through Saturday is from 11:30 to 4:00 p.m. Dinners are served 4:00-9:30 p.m. Sunday through Thursday and Friday and Saturday from 4:00-10:30 p.m.
Anthony's has a delicious menu revolving mainly around seafood but they also offer beef dishes as well as salads, their famous clam chowder (served in a bread bowl if you'd like), and great seafood choices such as seafood pastas, salmon burgers, or alder-plank salmon to name but a few. If you pop into Anthony's between 3:00 and 6:00 p.m., they have a delicious happy hour menu with salmon sliders and beef sliders for under $5 among other delectable offerings - and they also offer Sunset dinners Monday through Friday 4:30 to 6:00 p.m. for $18.95. Sunset dinners are 4-course dinners you don't want to miss for that price! Anthony's has a large outdoor seating area and many a sunny afternoon, we have requested and been granted table seating with 2 malamutes where we enjoyed the food, a good glass of wine and the folks strolling by beside the Deschutes River or floating by in rafts! Baltazar's is one of those restaurants you stumble upon that become a favorite overnight and that you long to go back to again and again. The 'problem' with Baltazar's though is that you have to space yourself because the food is so absolutely delicious you can hardly keep from overeating - and the portions are huge! Baltzar's is a Mexican seafood restaurant and they definitely know what they are doing in terms of combining seafood with typical Mexican dishes. I am still trying to recreate their chipotle cream sauce that they serve with their spinach enchiladas and their swordfish fajitas. The restaurant is open 7 days per week for lunch and dinner. The lunch portions are somewhat smaller than their dinner portions but they are still more than adequate. They serve tri-colored chips and salsa which doesn't help when it comes time for the entrée! Lunch is served at Baltzar's Monday through Friday 11:00 a.m. to 2:30 p.m. and on Saturday and Sunday from 11:00 to 3:00 p.m.
Dinner seating starts at 4:30 and they are open until 8:30 Sundays through Thursdays; Saturday and Sunday dinner hours are 4:30 p.m. to 9:30 p.m.
Baltazar's has a nice outdoor seating area but since we mostly visit this restaurant in the winter, we've never yet sat outside with our dogs or asked to be seated there. It is a wonderful dining experience and you won't believe the platters! 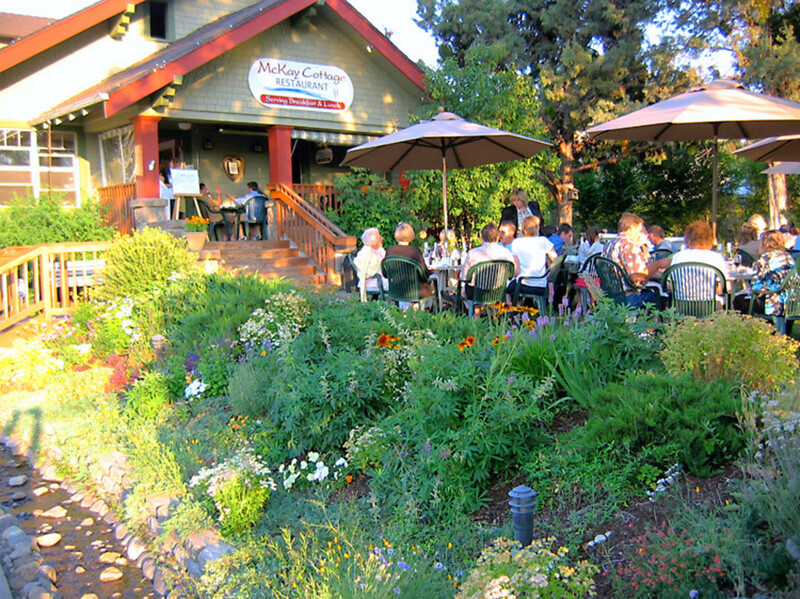 Cafe Alfresco is located in Redmond, Oregon which is about 15 miles north of Bend. This adorable little restaurant is a converted house that actually used to be the famous Mustard Seed Cafe for years. It then changed owners and survived okay but now that it has become Cafe Alfresco, it has flourished and we hope it is there for a good long time to come! The menu at Cafe Alfresco is mainly Italian and they are open for lunch and dinner Monday through Saturday. Lunch hours are 11:30 a.m. to 2:00 p.m. and dinner hours 5:00 p.m. to close. The Cafe Alfresco menu serves up tasty dishes like Chicken Alfredo or Chicken Parmesan that are absolutely delicious accompanied with Tuscan bread and wonderful green salads - but they also serve up sandwiches like their Chicken Parmesan Sandwich which my husband is personally hooked on and has to keep going back for more! They have an array of fantastic desserts, a full bar and also a beautiful little patio for outdoor seating weather permitting. We have been privileged to be allowed to sit outside with our malamutes in summer and dine - what a wonderful way to eat out. During the summer months, Cafe Alfresco also has had live performances such as plays and music on the patio which is a unique addition to dining out and much enjoyed by all. Diego's Spirited Kitchen is also a restaurant that I return to over and over simply because the food is excellent and the service wonderful. 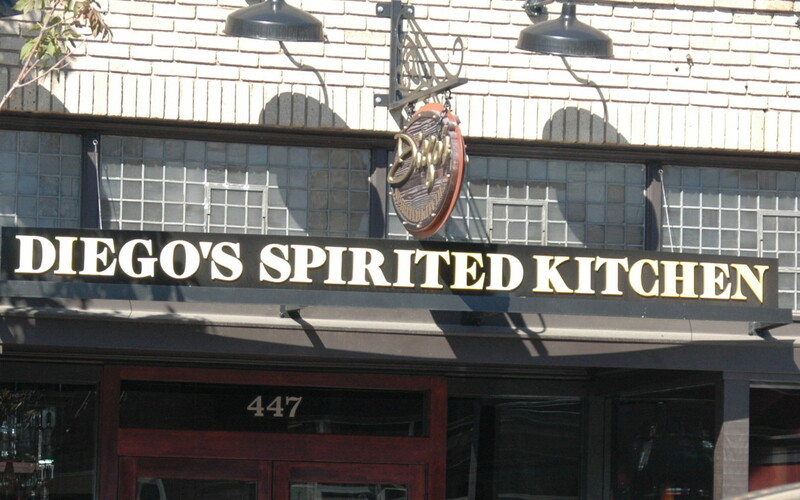 You can dine at Diego's Spirited Kitchen for lunch or dinner and they are open 11:00 a.m. to 10:00 p.m. 7 days per week. The menu at Diego's is a combination of Latin influenced offerings but there are also many American cuisine items to choose from such as steaks and fish done many different ways. A favorite for lunch at Diego's is the burger done on a soft cibatta roll or their delicious chicken flautas. Perhaps my favorite though is their happy hour menu which is extensive. It is served from 2:00 to 5:00 p.m. daily and you can get all sorts of wonderful things to share such as chicken tacos, flautas, nachos or spring rolls - all for under $5 each. It is definitely enough to make a meal. 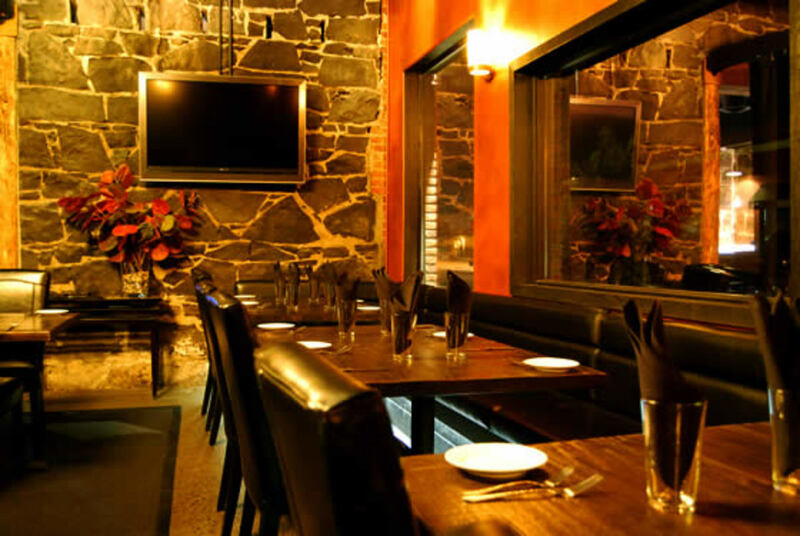 The restaurant has a wonderful ambiance about it and a warm, inviting interior. Great wine list to choose from and many beers on tap and by the bottle. They have a small patio out back and a table or two out front. While they say that they are not pet friendly, somehow we convinced them to let us sit outside with our 2 malamutes. While we were finishing up our meal, almost everyone in the restaurant came out to see our dogs! Diego's is a fantastic place for lunch or dinner and the food just doesn't get any better than this. 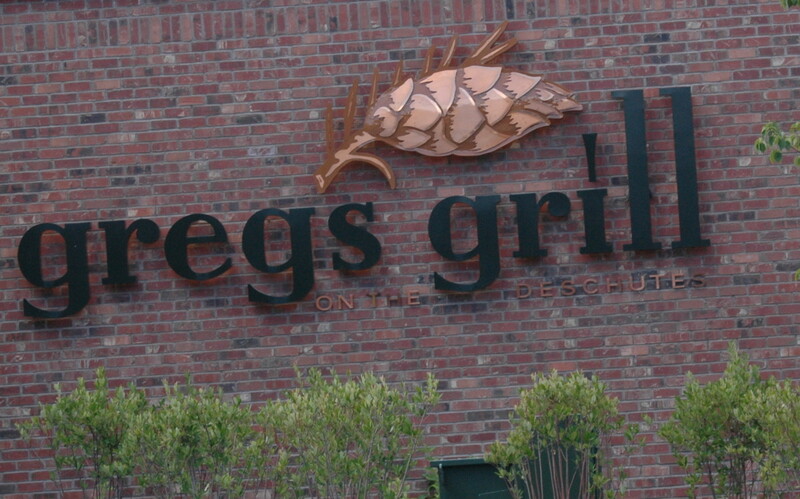 Gregg's Grill is a steakhouse located in the Old Mill District of Bend right on the Deschutes River. It is down the way a little from Anthony's at Bend. 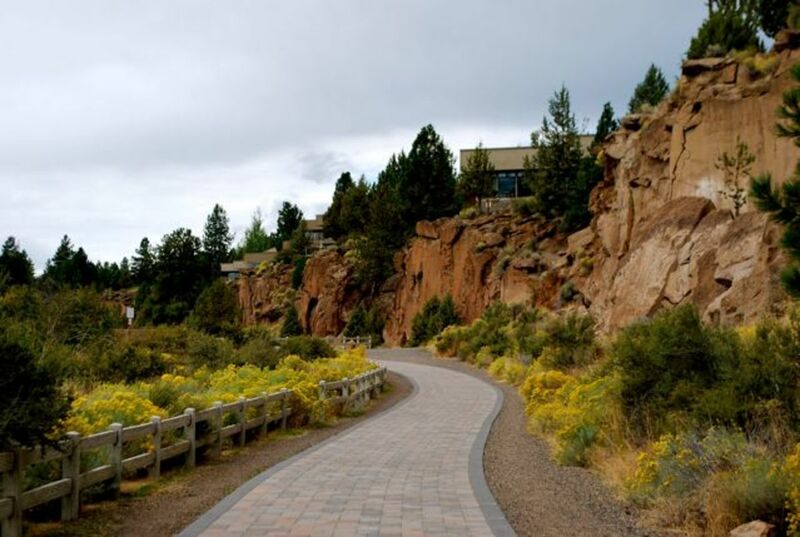 The building alone is worth the trip in to see because it is absolutely gorgeous with its slate floors and high-beamed ceilings accompanying the floor to ceiling windows looking out over the Deschutes. Most of the menu at Gregg's Grill is beef oriented although I have had a delicious pork chop there before and their soup and salad combo is excellent. You can get a steak sandwich or you can get prime rib depending on the time of day. The lunch menu has many things that the dinner menu has on it only smaller portions and you can dine in the bar which is large and spacious, the dining room which is huge, or weather permitting (though they never close the outside seating even in winter) you can dine outside on their large patio. Gregg's Grill is open 11:00 a.m. to 10:00 p.m. Sunday through Thursday and 11:00 a.m. to 11:00 p.m. on Friday and Saturday. For many a sporting event, we have eaten in the bar on a brisk fall or winter day and enjoyed ourselves immensely. The food is excellent, the service superb, and we have also been fortunate enough to be permitted to dine outside on a summer evening with our 2 malamutes. Truly a classy place for lunch, dinner or happy hour. The Terrebone Depot is located about 5 miles north of Redmond and just west of Smith Rock. This is a neat little restaurant/brew pub that is actually a restored old train depot. It is located virtually right at the railroad tracks! 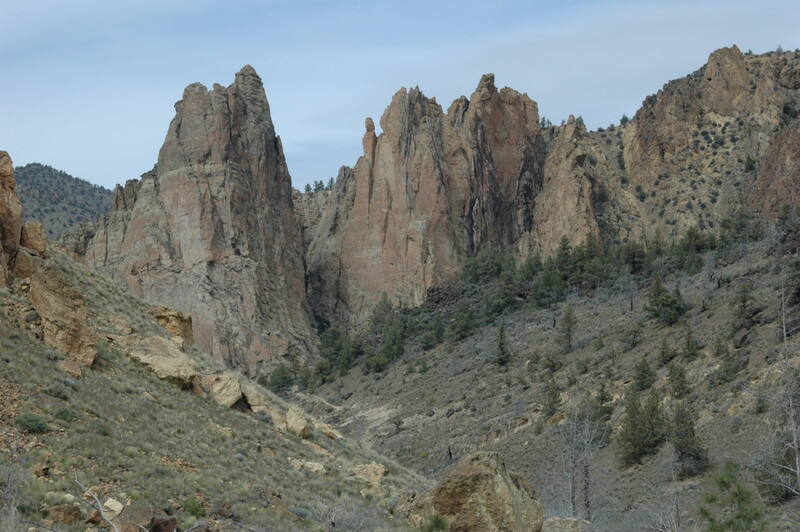 After a strenuous hike at Smith Rock (or mountain climbing if you are into that), it is a super place to unwind and have lunch or dinner. The Depot is open Monday, Wednesday, Thursday, and Sunday from 11:30 a.m. to 8:30 p.m., closed Tuesdays and then open Friday and Saturday from 11:30 a.m. to 9:00 p.m. The menu at Terrebone Depot covers a great range of dishes - from buffalo nachos to chicken quesadillas to grilled salmon to rib eye steaks. Their burgers are fantastic and you can also get pizzas here or even stuffed chicken! I recently had their hummus plate for lunch and it was absolutely delicious. This restaurant is one of the most pet friendly I've ever been at as they have dog bowls at the ready and you are encouraged to bring your dog to sit on the beautifully open deck. You can sit and relax and gaze out at the rock formations that make up Smith Rock with your dogs at your feet and enjoy a little slice of heaven. These are but a few of the many wonderful places to eat in Central Oregon and you can find your favorites among them or come up with other ones as you explore the fantastic array of eateries available in this beautiful part of the Northwest. No matter if you are looking for breakfast, lunch or dinner, I do believe you'll find these restaurants at the top of the list for quality of food, service and ambiance - and it doesn't hurt in my book that all these restaurants are pretty much pet friendly. Central Oregon is known for its pet friendliness by and large and when restaurants cater to the crowd that doesn't believe in leaving their animals in the car to swelter, you have to truly admire them and be grateful. I know I am! Wishing you happy dining experiences at my picks for the 10 best places to eat in Central Oregon. Truly it is, Micky - want to see some bike runs through Oregon! Great places! Oregon is so nice. Thank you Ma'am! Thanks, Dawn - it's a great place to live and hope you get to enjoy many parts of it!! what a hub on oregon, you did an excellent job!!! I am going to print this page and the others when I go to visit Oregon this year, I can't wait to hit up a few of these restaurants! excellent map and use a capsel, I will vote for you on this one!!! Griffin is a chow hound too - a couple of times it has been close - to where I figured he was going to jump into my lap and grab my burger but he's learned well. Thanks again for the read! Well done Audrey, I didn't know you'd won either. Congrats and well deserved too, very enjoyable hub. PS: Even if we had started Sassie as a pup it wouldn't have made a difference, she loves her food. And so she should, she lives with us, we have an Italian background so food is IT as far as we're concerned. Come on down, Laurel - or come on UP, Laurel! It's a fantastic place to live let alone vacation. We finally made the decision to 'just do it' and move here 6 years ago because we kept coming back! Seattle environs is great but it just got too busy and too chaotic all the time so we took a chance and here we are. We are about an hour outside of Bend in the sticks - but it's all good. 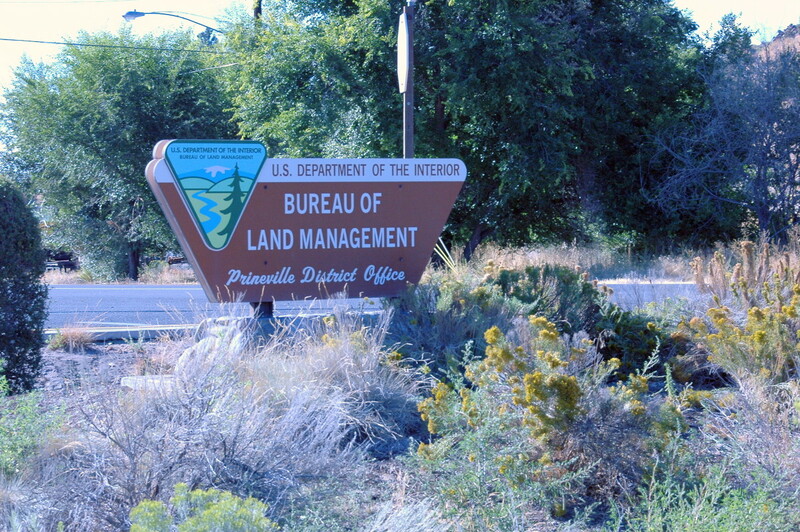 Bend is 'only' 80,000 people or so so we like the 'slower' pace. Thanks so much for commenting. And bring Ranger! Purple Perl - Thanks so much for the tag - and congrats on YOUR win. I had no idea there was a thread (oh duh) so didn't even know I won. Congrats to you as well! What a choice! And pet friendly too! Thanks for the great hub. Audrey-you've got me all aflutter with these lovely hubs on Bend. On Oregon! The food sounds amazing, and knowing I could bring Ranger along makes it even more attractive! Go North, young Laurel, go North! MPG - Ha ha on Sassie! Luckily we started with Griffin when he was just a baby last summer - although now it is too hilarious since his nose is over the table! He tries every now and again to grab something or act like we should feed him but it is great experience for them both to just lie down and chew on their little toy and behave. They always get treats afterward for their good behavior. 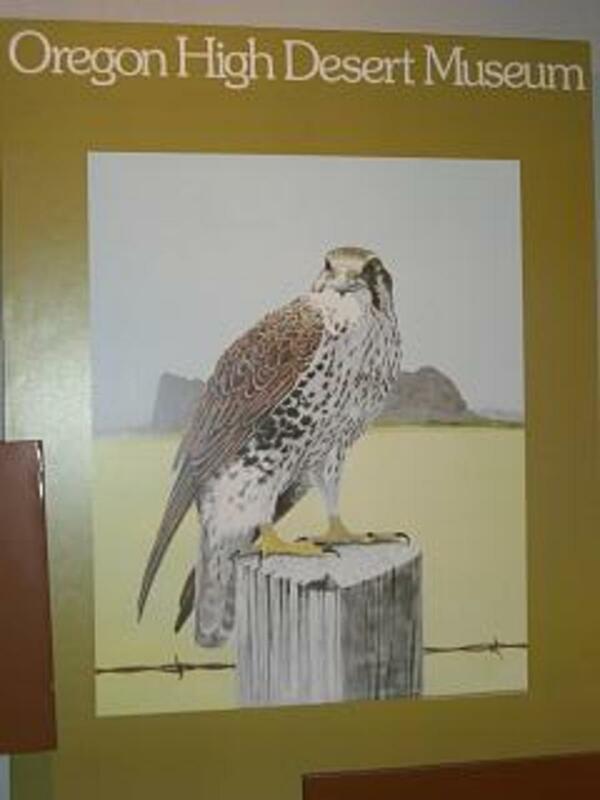 Yes, the slower pace is what Bob needed and it really is a cool place to be - every now and again I get SO mad because I can't find anything I need but I just go on line then and free shipping works! Central Oregon looks lovely and sounds yummy too. How nice to be able to take your pets with you, although Sassie would just go around to everyone's table and want to be fed. lol. The slower pace of life sounds great too, would love to visit one day. Thanks, Simone for the read - your kind remarks mean a lot to me!! We do love our goofy mals and love being able to take them with us so this one was kinda my 'cup of tea' and then some. Lovely place to live if you can handle the slower pace sometimes and am just grateful to be here. Lela - I totally agree! Folks are pretty laid back here and I think basically Bend is a super pet friendly town with the other outlying burbs following suit. Temps are so drastic here from super cold to boiling hot sometimes that it really does help that they understand and make it easier on us obsessed people! You are right about the bounty though - have to space out our trips to the restaurants! Gosh, Audrey, I would gain another 100 pounds if I lived in central Oregon with all these fine places to eat. To think you can even take your kids with you makes it even more special. It all looks so lovely, cool and scorpion free. Enjoy! Thanks very much Prasetio - as always! I would actually love to be a food critic and just keep reviewing places to eat. Love new cuisines and trying to recreate their dishes when I go home! HH - Thank you so much for the read and the compliment! They look great and you gave them full justice with your perfect hub. Thank you. I wish I could traveling to United States and I have a chance to visit one of the best places to eat un Central Oregon. Good information and I believe this is very useful for food lovers. My friend, you have complete information here. Thank you very much. Vote up as usual. Thanks Pamela for the read - wish you could visit as we truly do have a wonderful bunch of places to eat here! SG - I think Bend or Central Oregon in general is very sensitive to this issue although I read every day on blogs and such that folks are 'sick of seeing Fido at the local restaurant'. Oh well - it beats frying them in the car for those of us who can't leave them home because it is a long, long trek to the city. It is great training for our dogs especially and I do really appreciate these folks allowing our furry friends to accompany us! It is especially nice that these are all high quality restaurants! Thanks for the read!! Great article and who would have thought about pet policies? Thank you - that's a fantastic addition for anyone travelling with furry guys. Audry, I wish I was traveling in Oregon because those places all look great.